I have been submersed in the world of True Detective for the last 8 weeks and it is testament to the strength of writing by Nic Pizzolatto that a mere 8 episodes of television has generated so much online debate, discussion and theory. Here’s my favourite piece on the show by the fantastic Victorian Clare, please do check out her blog. 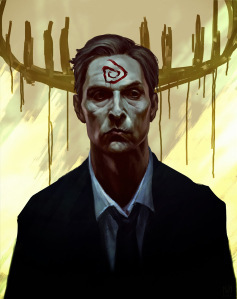 ‘True Detective – Rust’ by Nagy Norbert. Like many, many others, I’ve been captivated by HBO’s latest offering, True Detective. On the face of it a genre piece, a detective story, a serial killer story, centering on the sexual murder of women and children. And yet, as numerous cultural commentators soon realised, Nic Pizzolatto’s show, starring Matthew McConaughey and Woody Harrelson as Louisiana state detectives, was more than just a good cop show, it was a cultural phenomenon. This is no Law and Order: Louisiana, this show is as much about stretching convention as it was about conforming to it. As an academic who has been working on crime fiction for the last 7 years (my first book on the genre is out soon), I am particularly inclined to think about the show in relation to what it does with the crime genre itself.